The car’s impressive driving characteristics and striking good looks make it one of the best simple, driver-centric sports cars that money can buy. 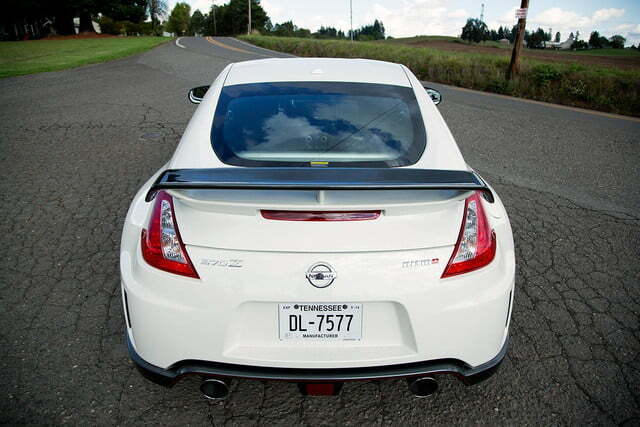 Update 11-13-14: This review originally covered the 2014 model year of the 370Z NISMO. 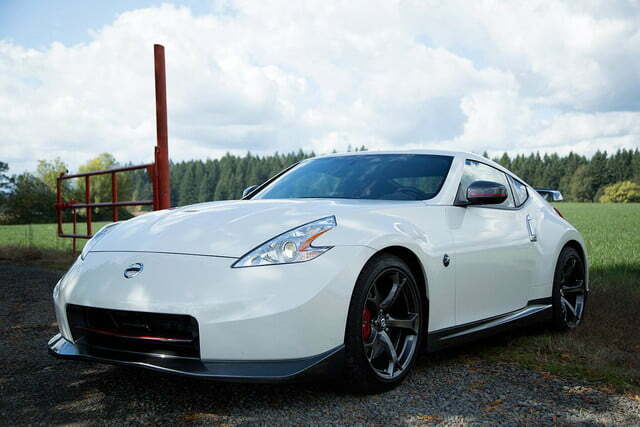 The 2015 370Z NISMO is in showrooms now. No substantial changes were made to the body or design of the car, but the interior is improved for the 2015 model year. All of the changes are listed below. Sports cars are interesting beasts. They started off many decades ago as rather simple, lightweight things, designed to simply be driving machines. A seat, steering wheel, engine, and rear-wheel drive is really the only thing a motoring enthusiast needs to shrug off the stresses of life and get lost in the road. Now, though, sports cars are different. Arguably, sports cars of today are some of the fastest, safest, most precise cars the motoring world has ever seen. At the same time, however, they’ve become heavy, complicated things weighed down by gadgets, gizmos, and German wizardry. Yes, they still allow for a heart-pumping Sunday drive, but most modern cars lack the absence of adornment to really allow a driver to become one with the pavement. 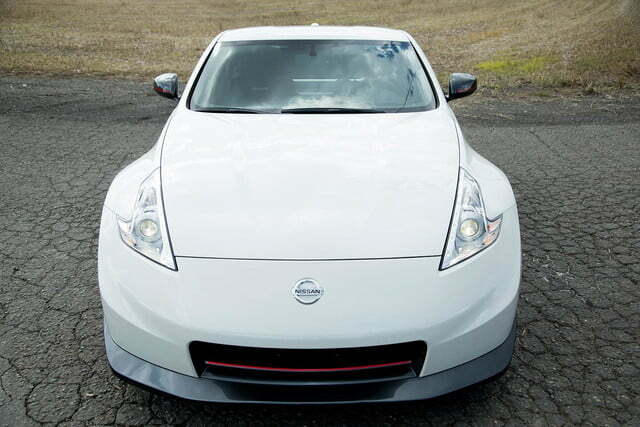 Thankfully, there is still a stripped down, simple sports car to be had: the 2014 Nissan 370Z NISMO. 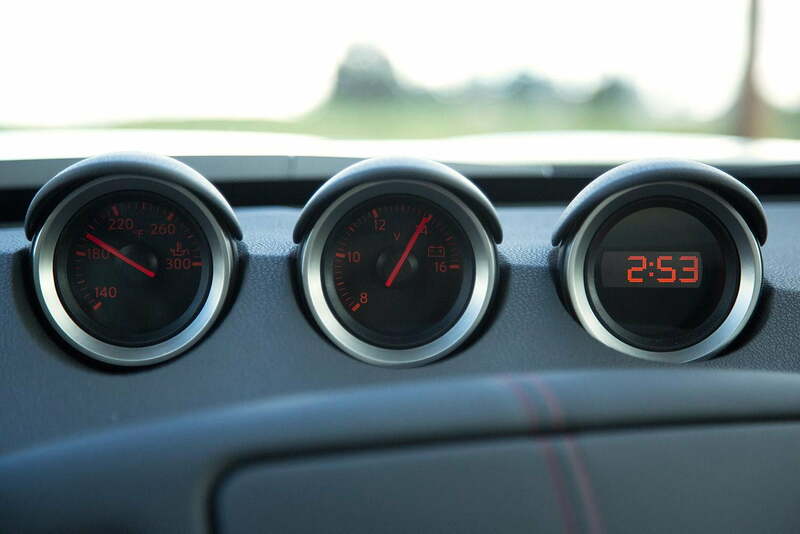 The origins of the 370Z stretch back to 1969 with the first Z car, the 240Z. The Z cars have always been known as the Japanese answer to the American Pony cars like the Mustang and the Camaro, but with their own, more compact flavor. 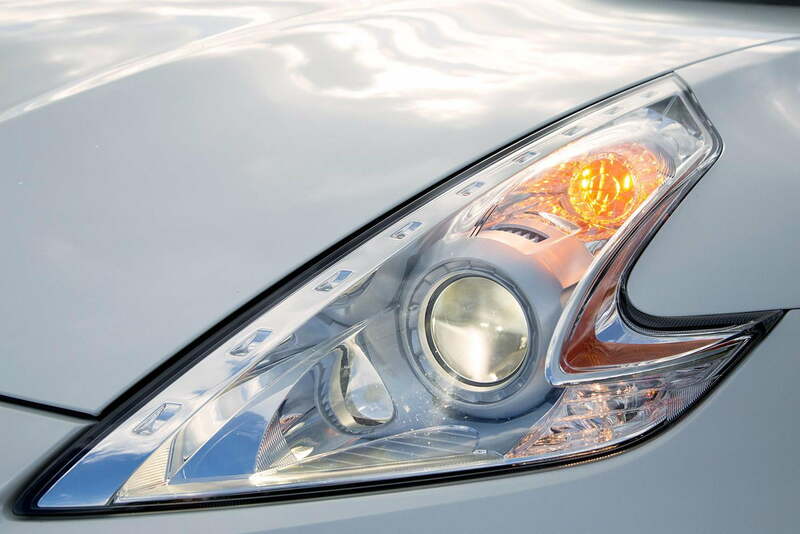 The 370Z we know today originally debuted in 2009 and has been updated a few times over the years. 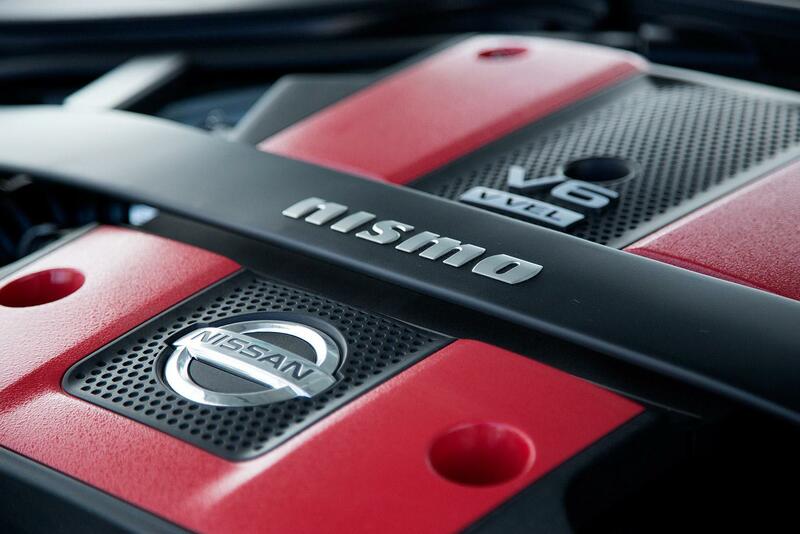 The NISMO is the most recent of those refreshes. 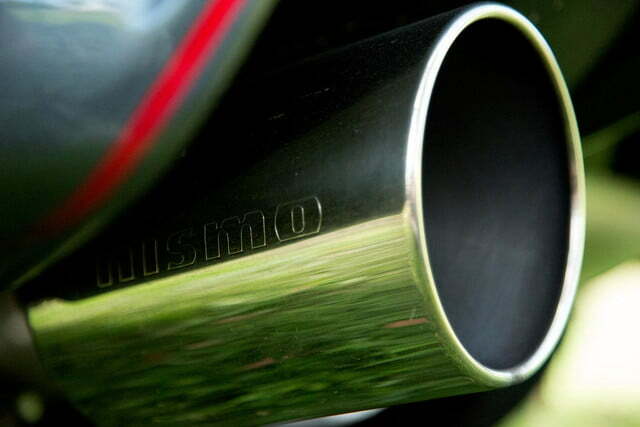 But what is NISMO? 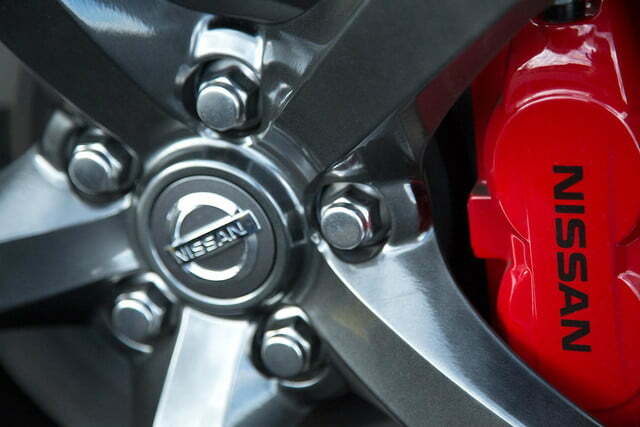 It’s an abbreviation for Nissan Motorsport International Limited, which is Nissan’s performance tuning arm. It is to Nissan what AMG is Mercedes-Benz or what M division is to BMW. The men at NISMO are responsible for all things ridiculous at Nissan. Lucky them. So when the designers at NISMO got their hands on the already unruly, 332-horsepower 370Z, what did they do to it? Like any good in-house tuner, they made the car better looking, more powerful, and faster. The result is a car that is 6.2 inches longer, 18 horsepower more powerful, and $16,000 more expensive than the base 370Z. 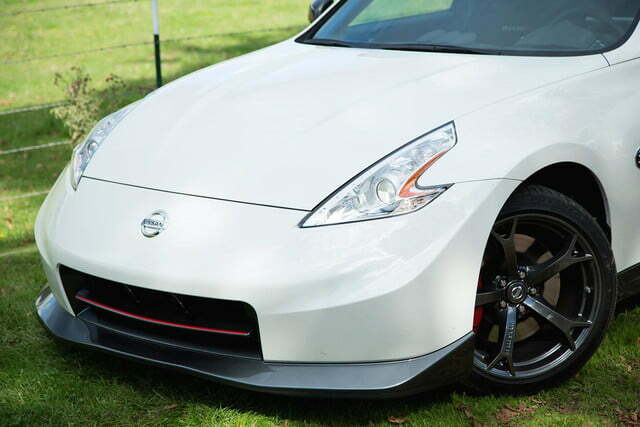 NISMO took the somewhat bland 370Z front end and bolted to it an extended front nose and integrated chin spoiler. Not only does this make the car look more dynamic with its gray and red accents against the white body paint, it also makes the 370Z grippier. 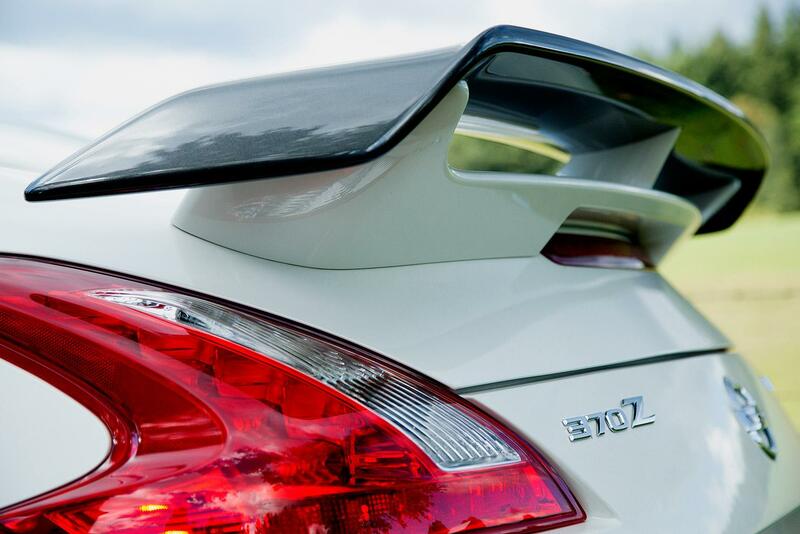 The nose and spoiler are carefully formed to increase airflow to the engine and also improve downforce, which uses wind resistance to push the car against the pavement, boosting tire traction. 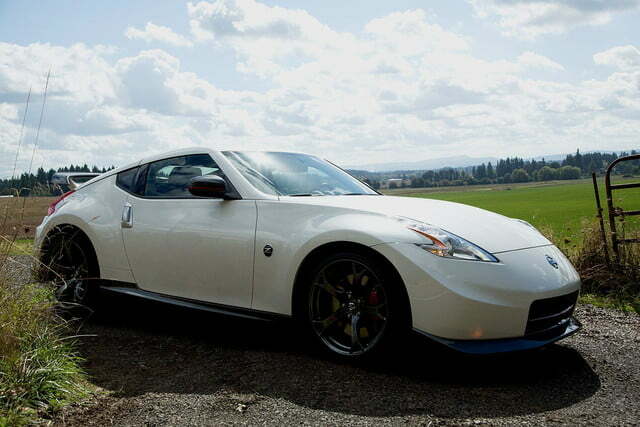 Out on the track or on a secluded country road, the 370Z NISMO is a motoring enthusiast dream. From there, NISMO upped the power output of the 3.7-liter normally aspirated V6 from 332 to 350 horsepower and 276 pound-feet of torque. From the souped-up V6, power is routed to the rear wheels through a six-speed manual transmission – no automatic is offered on the 370Z NISMO. Engineers added a “Sport” button to the transmission, too, which activates a system called SynchroRev Match. SynchroRev Match essentially blips the throttle on up or downshifts to match engine and transmission speed. 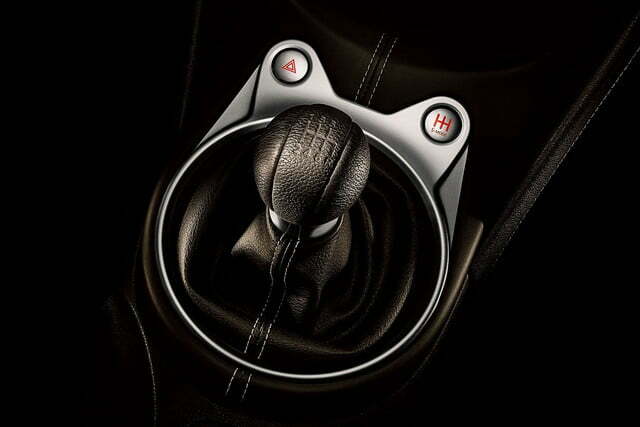 With this engaged, you can leave your left foot planted in the brake pedal as you downshift without having to come off and feather the throttle as you let the clutch out. Not only does rev match make the downshift experience much smoother for passengers, it’s allows for more spritely downshifts. Yes, rev matching does effectively do away with engine braking. Any benefits offered by engine braking that are sacrificed by rev matching are far outweighed by the smoothness of the system. As for the interior, NISMO went for lightness. Accordingly, the navigation unit has been removed and replaced with a storage cubby. For design dynamics, NISMO covered the steering wheel in Alcantara, added NISMO embroidery to the seats, and the colored the tachometer red. The rest, however, virtually remains the same as the standard 370Z. 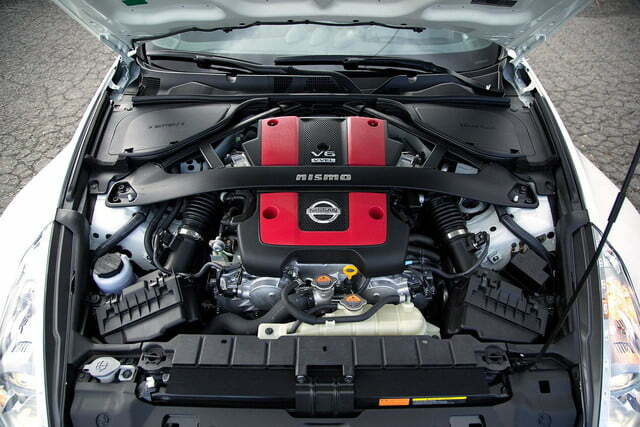 Nissan only offers one option on the 370Z NISMO: a Bose sound system with six speakers, two subwoofers, and Bluetooth. Step back out to the exterior and you’ll notice a huge rear wing bolted to the hatch. 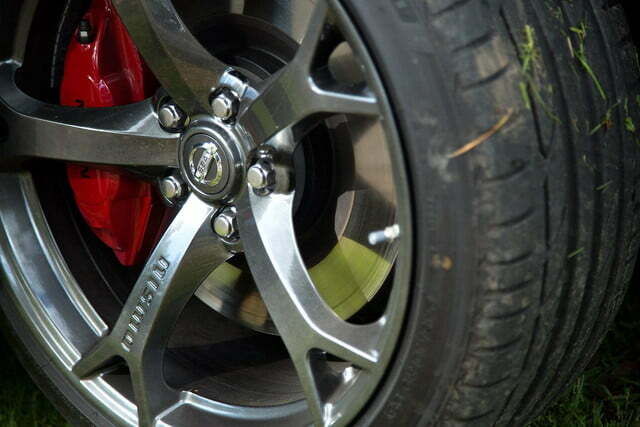 Down at ground level, NISMO included special 19-inch forged aluminum-alloy wheels backed by large 14-inch NISMO sport brakes at all four corners. And at the very backend of the car, you’ll find polished tailpipes that blow carbons from the engine through an H-style exhaust system. It would seem, then, we have the makings of a fantastic sports car. Yes, indeed we do. But, I’m afraid; it’s not quite that simple. 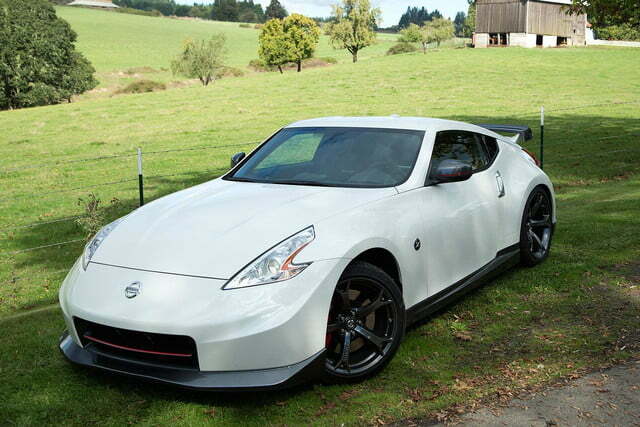 Out on the track or on a secluded country road, the 370Z NISMO is a motoring enthusiast’s dream. 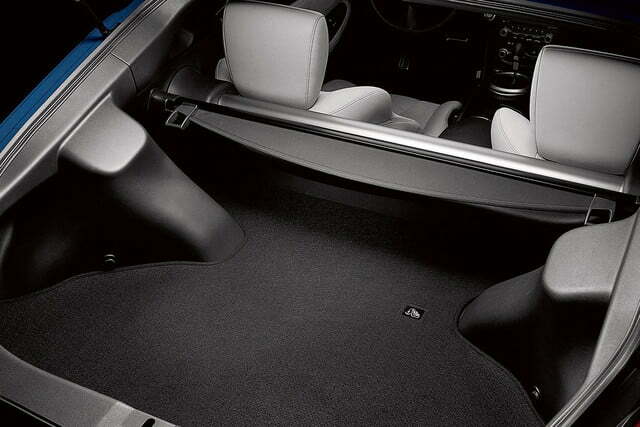 The engine note is deep, powerful, and echoes throughout the compact cabin. It’s not in anyway buzzy or annoying like other modern, high-power V6s. The transmission is exacting, crisp, and never leaves you wondering what gear you’ve grabbed. Heck, even if you do grab the wrong one, SynchroRev Match will sort out engine speed for you. In the 370Z NISMO, it’s so easy to lose yourself in a sunny day, looking across the well-sculpted hood and onto the pavement. 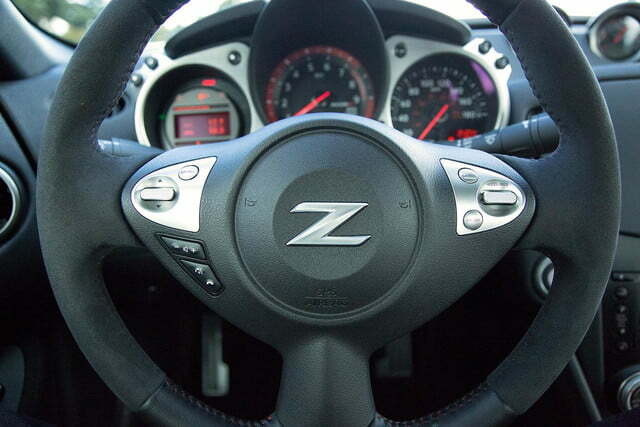 Unlike modern German and American sports cars, the 370Z still has hydraulic power steering. It’s a bit on the light side, but it fully reports back what’s happening on the road. You know every little thing that the wheels are doing at any given moment. It feels not like a mechanical system, but rather more like a living thing, full of vim and vigor. The brakes are top-notch, too. The pedal is light and quick to react. You can ride on the limits of your driving ability comfortably knowing that if you get a bit over your head, the brakes are there to reign the Z back in and bring you down to a safe speed – or to a quick stop. In the 370Z NISMO, it’s so easy to lose yourself in a sunny day, looking across the well-sculpted hood and onto the pavement, as you hug the double yellow line that leads you to driving nirvana. 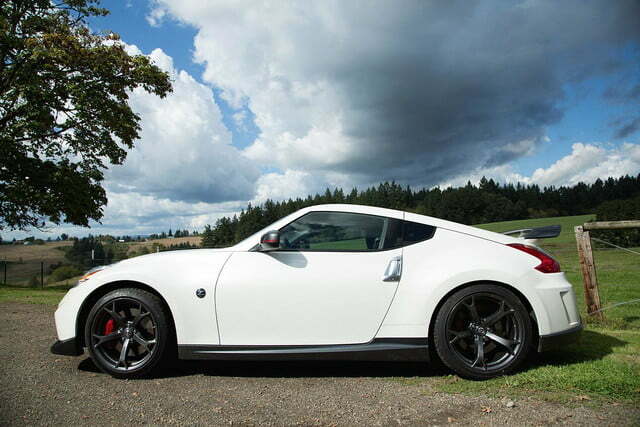 What, though, if you need to drive the 370Z NISMO to work or the store? Well, my friend, that’s a whole other story. Remember, the 370Z is a relatively simple, lightweight sports car. So while it performs with the best of them on the track and out on secluded country roads, it might shock and horrify you during your daily drive. The first thing you’ll notice is how bloody loud the thing is. I don’t mean the engine or exhaust, which are also noisy, but rather the white noise of wind and tire friction rolling over rough pavement. Anything over 20 mph is a dull roar. Highway speeds make conversation between the two passengers a near impossibility without going hoarse. While the rough pavement will make you deaf in the Z, it will also destroy your lower back, as the 370Z NISMO’s suspension is brutally stiff. These hard-riding springs might be brilliant for cornering but they’re absolute murder anywhere else. At 28 years old, I thought I had several more decades before I found myself complaining about unforgiving suspension. And yet here we are. As for storage: There is none. Yes, the two-door, two-seater 370Z might have a hatch. Lift it, though, and you’ll find a luggage shelf roughly eight inches deep. So if you were hoping to haul more than a hat, you’re out of luck. 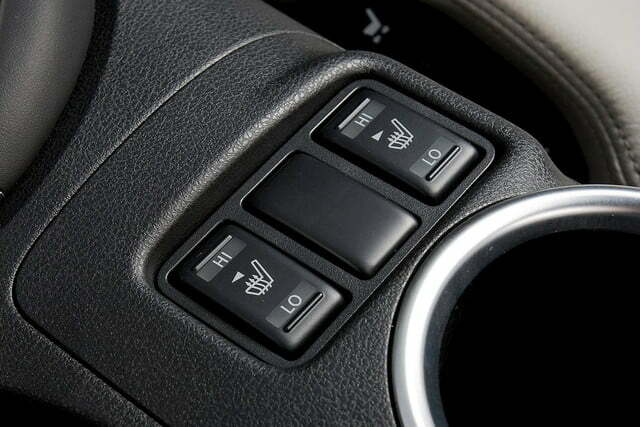 Then there’s the fuel economy. Yes, you might be getting 350 ponies from your V6, which makes for much fun on the road, but you’ll pay for it at the pump. Nissan rates the 370Z NISMO at an average of 18 mpg. I got 13 mpg – and I wasn’t always hammering the thing. You also can’t take the car through a car wash. 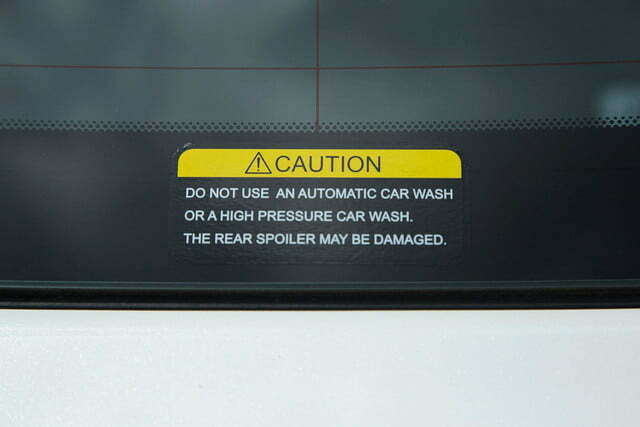 I don’t mean, “Oh you should probably avoid car washes.” I mean: the car has a sticker on the back window telling you explicitly not to take it through a car wash, as it might damage the huge rear wing. 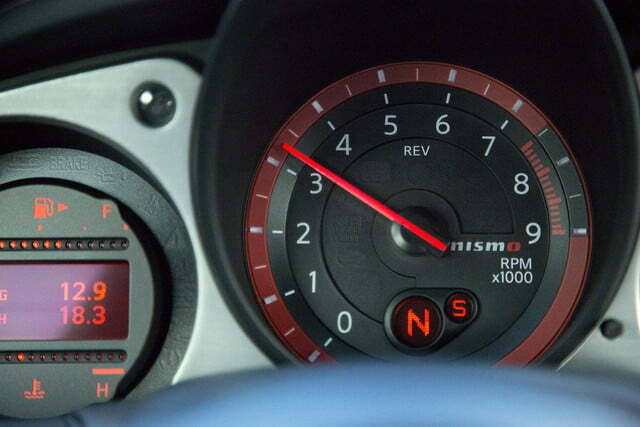 The Nissan 370Z NISMO, I’m afraid, is unlivable as a daily driver. It is everything you want in a sports car and everything you don’t want in a daily driver. 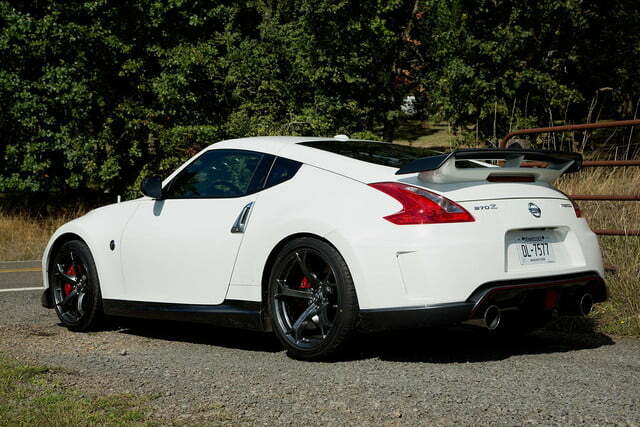 So, if you can afford to drop $46,000 on gorgeous a toy that spends the vast majority of its life in the garage, then absolutely get the 370Z NISMO. It’ll make you far happier than any similarly priced German or American sports car. If you want a car that is a great weekend and track car but also a comfortable daily commuter, though, get a Porsche Boxster. You might pay more in the showroom and again when it comes time for servicing, but at least you won’t go deaf and lose your voice behind the wheel of the Porsche.